Sodium (chemical symbol Na, atomic number 11) is a member of a group of chemical elements known as alkali metals. Silvery in color, it is soft, waxy, and lightweight. It is highly reactive, oxidizing rapidly in air and reacting violently with water to produce the alkali sodium hydroxide and hydrogen gas. Given its reactivity, sodium is not found as a free metal in nature but is bound to other elements in the form of compounds. It also occurs as cations in seawater. Sodium metal can be used to isolate some other metals from their compounds, smoothen metal surfaces, and manufacture several compounds. 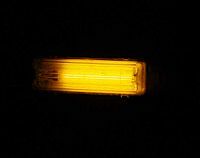 Sodium vapor lamps provide bright illumination at low cost. An alloy of sodium and potassium (NaK) is a heat-transfer medium and a chemical reducing agent. Moreover, the compounds of sodium have numerous applications. Common salt, or table salt, is sodium chloride, widely used as a food flavoring. It provides the body with sodium ions, which are essential nutrients, but excessive amounts are harmful for health. It is also an agent for de-icing highways in the winter. Sodium bicarbonate is an antacid, a leavening agent in baking, and an ingredient in some forms of toothpaste. Sodium hydroxide is a powerful chemical base, but sodium bicarbonate and sodium carbonate are also used to raise the alkalinity of solutions. The carbonate, chloride, and hydroxide of sodium are important industrial chemicals, used in the manufacture of glass, pulp and paper, textiles, soaps and detergents, and other sodium salts. Compounds of sodium have long been known. The metal itself was first isolated in 1807, when Sir Humphry Davy carried out the electrolysis of caustic soda (sodium hydroxide). Sodium was deposited on the cathode. The name sodium comes from the English word, soda. The symbol for sodium, Na, comes from the neo-Latin name for a common sodium compound called natrium. That name in turn comes from the Greek nítron, a kind of natural salt. In medieval Europe, a compound of sodium with the Latin name sodanum was used as a headache remedy. Sodium is the most abundant alkali metal and makes up about 2.6 percent by weight of the Earth's crust. Naturally occurring sodium is bound to other elements in many minerals. The most common sodium-containing mineral is halite (or rock salt), chemically known as sodium chloride. Other minerals that contain sodium include cryolite (sodium aluminum fluoride), soda ash (sodium carbonate), and soda niter (or Chile saltpeter, sodium nitrate), as well as several members of the amphibole and zeolite groups of minerals. Sodium is relatively abundant in stars. Its spectral lines, known as the sodium D lines, are among the most prominent in starlight. At the end of the nineteenth century, sodium was chemically prepared by heating sodium carbonate with carbon to 1,100 °C. The reaction may be written as follows. Na2CO3 (liquid) + 2 C (solid, coke) → 2 Na (vapor) + 3 CO (gas). Sodium is now produced commercially through the electrolysis of fused (liquefied) sodium chloride. In this process, known as the Downs process, calcium chloride is mixed with the sodium chloride to lower the melting point below 600 °C. Sodium, but not calcium, is deposited on the cathode. This method is less expensive than the earlier method of electrolyzing sodium hydroxide. The flame test for sodium displays a brilliantly bright yellow emission due to the so-called "sodium D lines" at 588.9950 and 589.5924 nanometers. As an alkali metal, sodium lies in group 1 (former group 1A) of the periodic table, between lithium and potassium. In addition, it is at the beginning of period 3, situated just before magnesium. Like the other alkali metals, sodium metal is a soft, lightweight, reactive metal. Owing to its extreme reactivity, its occurrence in nature takes the form of compounds, never as the pure element. Sodium metal floats on water and reacts violently with it, releasing heat, hydrogen gas, and caustic sodium hydroxide solution. When sodium or its compounds are burned in a flame, they give off a distinct yellow color, corresponding to two main spectral lines—the "sodium D lines" at wavelengths 588.9950 and 589.5924 nanometers. In 1860, in their paper "Chemical Analysis by Observation of Spectra" in the scientific journal Annalen der Physik und der Chemie, Gustav Kirchhoff and Robert Bunsen reported: "In a corner of our 60 cu.m. (cubic meter) room farthest away from the apparatus, we exploded 3 mg. (milligrams) of sodium chlorate with milk sugar, while observing the nonluminous flame before the slit. 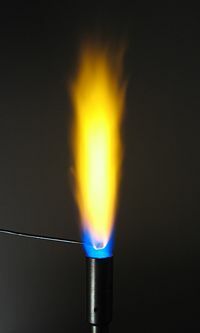 After a few minutes, the flame gradually turned yellow and showed a strong sodium line that disappeared only after 10 minutes. From the weight of the sodium salt and the volume of air in the room, we easily calculate that one part by weight of air could not contain more than 1/20 millionth weight of sodium." Under extreme pressure, sodium departs from standard rules for changing to a liquid state. Most materials need more thermal energy to melt under high pressure than they do at normal atmospheric pressure. This is because the molecules are packed closer together and have less room to move. At a pressure of 30 gigapascals (300,000 times sea-level atmospheric pressure), the melting temperature of sodium begins to drop. 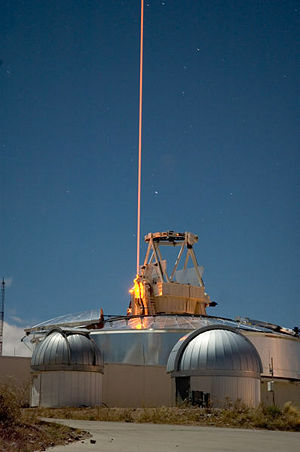 At around 100 gigapascals, sodium melts near room temperature. A possible explanation for the aberrant behavior of sodium is that this element has one unpaired electron (in the outermost shell) that is pushed closer to the other ten electrons when placed under pressure, forcing interactions that are normally absent. While under pressure, solid sodium assumes several odd crystal structures, suggesting that the liquid might have unusual properties such as superconductivity or superfluidity (Gregoryanz et al. 2005). There are 13 known isotopes of sodium, of which the only stable one is 23Na. Sodium has two radioactive cosmogenic isotopes—that is, isotopes produced when high-energy cosmic rays interact with the nuclei of sodium atoms. They are 22Na, with a half-life of 2.605 years, and 24Na, with a half-life of about 15 hours. Exposure to high levels of neutron radiation (such as from a nuclear reactor accident) converts some of the stable 23Na in human blood plasma to 24Na. By measuring the concentration of the latter isotope, the neutron radiation dosage to the victim can be computed. Sodium metal should be handled carefully at all times. It is highly explosive in water and is a poison when uncombined with other elements. The powdered form may burn spontaneously in air or oxygen. For these reasons, sodium must be stored either in an inert atmosphere or under a liquid hydrocarbon such as mineral oil or kerosene. Sodium bicarbonate (NaHCO3) is also known as sodium hydrogen carbonate, or bicarbonate of soda, or baking soda. It is a soluble white compound, with a slight alkaline taste resembling that of sodium carbonate. It is found in many mineral springs and also produced artificially. When exposed to an acid, sodium bicarbonate releases carbon dioxide and water. The reaction is as follows. Sodium carbonate (Na2CO3), also known as washing soda or soda ash, is a sodium salt of carbonic acid (H2CO3). It most commonly occurs as a crystalline heptahydrate (Na2CO3.7H2O) that readily loses water from the crystals to form a white powder, the monohydrate (Na2CO3.H2O). It has a cooling, alkaline taste and can be extracted from the ashes of many plants. It is produced artificially in large quantities from common salt (sodium chloride). Although sodium carbonate is soluble in water, it can occur naturally in arid regions, especially in the mineral deposits (evaporites) formed when seasonal lakes evaporate. Deposits of the mineral natron, a combination of sodium carbonate and sodium bicarbonate, have been mined from dry lake bottoms in Egypt since ancient times, when natron was used in the preparation of mummies and in the early manufacture of glass. Sodium chloride, also known as common salt or table salt, is a compound with the chemical formula NaCl. It is found in large quantities in seawater and as the mineral halite or rock salt. It is the salt most responsible for the salinity of the oceans. It is produced by the evaporation of seawater, brine wells, and salt lakes, and by mining rock salt. This salt is essential to life on Earth. It is present (at various concentrations) in most biological tissues and body fluids. The concentration of sodium ions in the blood is directly related to the regulation of safe body-fluid levels. The propagation of nerve impulses (by "signal transduction") is regulated by sodium ions. Humans are unusual among primates in secreting large amounts of salt by sweating. On the other hand, too much salt in the body is bad for health. As the main ingredient in edible salt, sodium chloride is commonly used as a condiment and food preservative. Its usefulness as a food preservative helped eliminate human dependency on the seasonal availability of food and allowed travel over long distances. By the Middle Ages, caravans consisting of as many as 40,000 camels traversed four hundred miles of the Sahara bearing salt, sometimes trading it for slaves. There are many references to common salt in the Bible. A familiar story is about Lot's wife, who was turned into a pillar of salt when she disobeyed the angels and looked back at the wicked city of Sodom (Genesis 19:26). In the Sermon on the Mount, Jesus told his followers that they were the "salt of the earth," referring to their internal, spiritual flavoring that they needed to distribute to others. Furthermore, in several religious traditions, common salt is used to bless (or spiritually purify) people, places, and things. This usage is probably based on the clean appearance of pure salt, its chemical stability, and its value for living things. Sodium hydroxide (NaOH), also known as lye or caustic soda, is a strong chemical base, widely used in chemical laboratories and in industry. The pure substance is a white solid, available in pellets, flakes, and granules, and also as a 50 percent saturated solution. It readily absorbs water and carbon dioxide from the air, so it should be stored in an airtight container. This substance is very soluble in water, and the process of dissolving it liberates heat. It also dissolves in other polar solvents such as ethanol and methanol, but it is insoluble in nonpolar solvents such as diethyl ether. Gloves and eye protection should be worn when using sodium hydroxide, because it can cause chemical burns, injury or scarring, and blindness. An apron of polyvinyl chloride is also recommended when concentrated solutions or the solid form are used. It should be stored well away from strong acids such as sulfuric acid. Caustic soda is produced by the electrolysis of an aqueous solution of sodium chloride. It builds up at the cathode, where water is reduced to hydrogen gas and hydroxide ions. The process, called the "chloralkali process," also produces chlorine. Such acid-base reactions can also be used for titrations, and this is a common way for measuring the concentration of acids. Related to this is the reaction of sodium hydroxide with acidic oxides such as carbon dioxide (CO2) and sulfur dioxide (SO2). Such reactions are often used to "scrub" harmful acidic gases (like SO2 and H2S) and prevent their release into the atmosphere. Sodium hydroxide slowly reacts with glass to form sodium silicate, so glass joints and stopcocks exposed to NaOH have a tendency to "freeze." Laboratory flasks and glass-lined chemical reactors are damaged by long exposure to hot sodium hydroxide, and the glass becomes frosted. Sodium hydroxide does not attack iron or copper, but many other metals—such as aluminum, zinc, and titanium—are attacked rapidly. For this reason, aluminum pans should never be cleaned with lye. Unlike NaOH, the hydroxides of most metals are insoluble, and therefore sodium hydroxide can be used to precipitate metal hydroxides. One such hydroxide is aluminum hydroxide, used as a gelatinous floc to filter out particulate matter in water treatment. Sodium, its alloys, ions, and compounds have a wide range of applications. Some of them are listed below. The metallic form of sodium can be used to isolate some metals, such as zirconium and potassium, from their compounds. Sodium metal is used to manufacture several compounds, including sodium cyanide, sodium hydride, and sodium peroxide. Sodium is used to descale (smoothen) metal surfaces and to purify molten metals. Sodium vapor lamps provide an efficient means of producing light from electricity. Sodium is added to certain alloys to improve their structure. An alloy of sodium and potassium (NaK) is a heat-transfer medium and a chemical reducing agent. Soap is generally a sodium salt of certain fatty acids. Sodium bicarbonate is used as an antacid to treat acid indigestion and as an ingredient in some types of toothpaste. In combination with acidic materials (such as lemon juice), it acts as a leavening agent in baking. It is commonly used to increase the alkalinity of water in pools and spas, especially when the chlorine content is high. Sodium carbonate is used in the manufacture of glass, paper, detergents, and chemicals such as sodium silicates and phosphates. Many chemical industries use it as an alkaline agent. It is widely used in processing photographic film, when alkaline conditions are needed for the action of developing agents. Domestically, it is used as a water softener for laundry, as it prevents magnesium and calcium ions in hard water from bonding to the detergent. Sodium chloride is widely used as a flavor enhancer in foods. It is also used in manufacturing pulp and paper, setting dyes in textiles, and producing soaps and detergents. In much of North America, large quantities of rock salt are used to help clear highways of ice during winter. In addition, sodium chloride is the raw material used to produce chlorine, which in turn is used for the production of many modern materials including polyvinyl chloride and pesticides. Sodium hydroxide is used in industry mostly as a strong chemical base in the manufacture of pulp and paper, textiles, soaps, and detergents. It is used to drive chemical reactions and to measure the concentrations of acids. Food uses of lye include washing or chemical peeling of fruits and vegetables, chocolate and cocoa processing, caramel color production, poultry scalding, soft drink processing, and ice cream thickening. Olives are often soaked in lye to soften them, while pretzels and German lye rolls are glazed with a lye solution before baking to make them crisp. Sodium hydroxide is used in the home as an agent for unclogging blocked drains. Sodium ions play important roles in a variety of physiological processes. For example, sodium ions are necessary for the regulation of blood and body fluids, transmission of nerve impulses, heart activity, and various metabolic functions. Unfortunately, many people ingest sodium chloride (table salt) in excess, which can have negative effects on health. It can lead to elevated levels of blood pressure, which in turn is associated with increased risks of heart attack and stroke. Excessive salt consumption can also dehydrate the human body. Many microorganisms cannot live in an overly salty environment, as water is drawn out of their cells by osmosis. For this reason, salt is used to preserve some foods, such as smoked bacon or fish. It has also been used to disinfect wounds. Gregoryanz, E., et al. (2005). Melting of dense sodium. Physical Review Letters: in press. This page was last modified on 8 October 2015, at 15:18.